If you have a young family, the kitchen is bound to become the heart of your home. You’ll not only be using it to prepare delicious meals for them (or microwaving something from the supermarket! ), but also teaching your children how to cook for themselves. So if you are renovating, it’s a good time to talk to us about family-friendly kitchen designs. Our designers can help you create a kitchen that is not only beautiful and hard-wearing but also fit for all the kids’ activities that are bound to go on in it. Spending time teaching your children to cook has some surprising benefits. It’s obviously one of the most important life skills you can also teach them about food groups, nutrition and where food comes from in terms of where it’s grown and how it’s grown. But there are also other, more surprising life skills and psychological benefits too, you’ll also be helping to improve their language and literacy whilst looking through recipes, as well as their maths skills by weighing out ingredients. Probably the most kid-friendly recipe, to begin with, is chocolate crispies – many grown-ups have fond memories of making when they were young, probably because they’re easy to make and most kids love them! Check out the website for the Cbeebies programme I Can Cook, It has recipes and advice for helping younger children who are keen to start experimenting in the kitchen. The kitchen can become a hub of arts and crafts activity. All you need is a newspaper to spread on the table, a lot of great ideas and some paper, glue, paints, crayons, glitter, toilet roll holders, yoghurt pots or whatever you can lay your hands on. One activity that lends itself to spending many happy (and hopefully quiet) hours as the children sit around it to make sculptures, decorations and Christmas tree ornaments out of salt dough. It’s very easy to make. All you need are equal amounts of plain flour and salt, and also some tepid or warm water. Put the flour and salt into a bowl and add the water a little at a time, stirring as you go until the mixture becomes sticky, but not so tacky it sticks to your fingers. Then it’s time to get creative! Once the little ones are happy with their work, put the shapes onto a baking tray and put into the oven at a low temperature for around three hours (or longer for larger sculptures) until they’re dry. And when the cooked art has cooled off, it’s time to paint and decorate them. More mess, but more fun and more happy childhood memories! You can also use things you find in the kitchen to get your kids interested in simple and fun science experiments to stimulate an interest in science and chemistry. The Royal Institution has devised a range of fun kitchen science experiments to do with kids aged between 5 to and 10 years. They have videos and worksheets showing you how to make a range of things from singing wine glasses to self-inflating balloons and teaching the kids about scientific principles from balance to perspective. Perhaps the most important thing you can do around the kitchen table is spending time together as a family. More and more families are rediscovering the joy of eating meals together without the constant interruptions from the TV or electronic gadgets, and often it’s the only time they get to talk properly and catch up with what everyone’s doing. The children from families who engage with each other are less likely to play truant at school, more likely to get higher grades, and less likely to have weight issues. 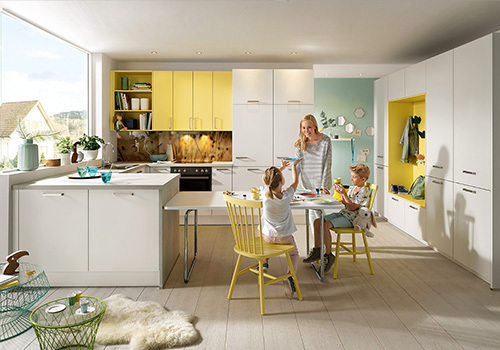 If you are planning a new kitchen the whole family will enjoy spending time together in, visit our Hertfordshire/North London showroom for design ideas and talk to our friendly advisors.